Oh my, it's been a long time since I have scrapbooked. I was invited to an awesome retreat last weekend with friends and scrapped my heart out. I'm attending another retreat next month and was asked to have a class. While I was tempted to do just a card, I'll be with an awesome group of talented scrapbookers. This is the first page of a 2-page layout I will be teaching. This page is perfect for photos of loved ones or special friends, a church group, or any group of folks who make you feel good. 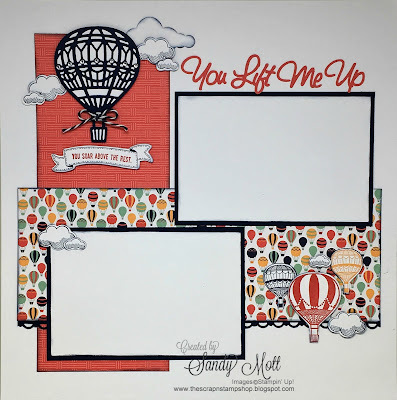 I used the "Lift Me Up" stamp set and the "Up & Away" Thinlits Dies (Occasions Catalog). The paper is from the Designer Series Pack, called "Carried Away", and is a FREE with a $50 order during Sale-A-Bration (ends March 31). The title is a font on my computer and cut with my Silhouette from Watermelon Wonder cardstock. 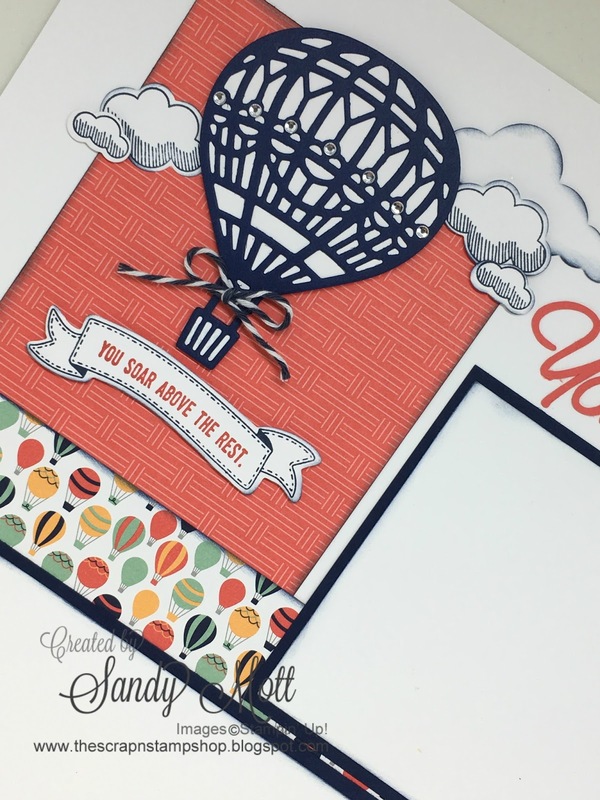 The Night of Navy fancy edging on the bottom is not a Stampin' Up product (but don't tell anyone). Actually, I believe Stampin' Up used to carry a similar punch but is now retired. The sentiment "You Soar Above The Rest" is also from the Lift Me Up stamp set and the banner is from the "Birthday Banners" stamp set (Annual Catalog). I used Watermelon Wonder, Night of Navy, and Peekaboo Peach inks. The background is obviously Whisper White cardstock and the photo mats are mounted on Night of Navy cardstock. I added Rhinestones to the hot air balloon because a girl has to have bling somewhere. Hope you like today's post - I would love to hear from you! Wow!! What a great layout - beautiful!! They will love it!! 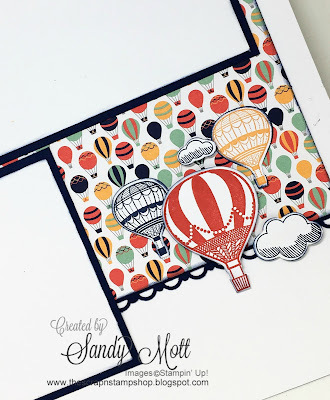 What an awesome scrapbook page layout utilizing Stampin' Up! products!! Love it! Beautiful layout! I have missed seeing your work in scrapbook pages! Thanks so much Beth! I have missed scrapbooking, but hope to do more this year.